I admit it: sometimes I do feel an “explosion of emotions” when I pass a bakery display case. But I wouldn’t have thought a perfumer's rendition of an emotional explosion would give off so much brioche and baba au rhum. To me, that’s just what L’Artisan Parfumeur Explosions d’Emotions Amour Nocturne and Déliria do. They smell like sophisticated pastries steeped in liqueur — and for Déliria, sitting in a crimped foil holder. L’Artisan Parfumeur released three fragrances in its Explosions d’Emotions collection: Amour Nocturne, Déliria, and Skin to Skin (which Robin will review later this week). L’Artisan describes the collection as “Three concepts, translating the extraordinary emotional power of fragrance, created without compromise, with master perfumer Bertrand Duchaufour.” They’re packaged in a larger, squat version of the perfume house’s classic columnar, heptagon1 bottle and cost an eye-popping $280 each. So, what do we get for all that cash? Amour Nocturne's listed notes are cedar, hot milk, caramel, gunpowder and orchid. This list of notes is so visual. I see a cedar tree, a porcelain pitcher of steaming milk (couldn’t possibly be chilled milk), a small copper pan simmering with caramel, a cooling pistol, and stems of yellow Cattleya orchids tinged with magenta. I’d love to see this painted by a Flemish master or maybe by a 1930s pulp noir cover artist. What Amour Nocturne smells like probably has been painted, but by Wayne Thiebaud. In style, it reminds me of the creamy-bready Arquiste Anima Dulcis without the alluring initial funk and with a dose of cedar. Amour Nocturne starts off with an herbal kick that, I swear, hints of dill before diving into the gourmand territory of cream, buttery bread and tonka. Sharp, tangy cedar firmly cuts through what could otherwise be — and still will be to some people — a cloying composition. This is my favorite part of Amour Nocturne. 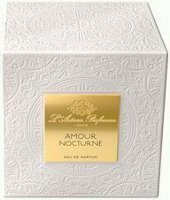 Some perfumers might have been tempted to toss in raspberries to make Amour Nocturne easier to love instantly, and patchouli to ground it, and I’m grateful Amour Nocturne didn’t go that way. The fragrance lasts a good long time on my skin. I dabbed from a sample vial, but I imagine the spray would give vigorous sillage. Still, $280? I’d go for Anima Dulcis instead to scratch that kind of perfume itch, but if you love a mouth-watering gourmand fragrance with an interesting twist, you should give this one a try. Déliria's notes include metallic, rum and gourmand notes, plus toffee apple and candy floss. “Déliria” might be renamed "Deliriously Ill", judging from that list of notes. Thankfully, the fragrance isn’t as circus-friendly as its list of notes suggests. In a nutshell, Déliria is like eating a brandied cherry while holding an abraded silver spoon in your mouth. It’s sweet and fruity and insistently metallic. Although Déliria stays in the dessert category with Amour Nocturne, it is cooler, less creamy, less buttery, and not as bready. To me, its fruit is all about cherries and not so reminiscent of apples. The fruit is secondary, though, to the cane sugar in which it’s steeped. Although the fragrance stays sweet, it also stays cool and liquid as it dries down, instead of breaking into a typical sandalwood-amber-musk you might expect (and fear). Déliria, like Amour Nocturne, persists on skin all day, even when dabbed from a sample vial. I can’t see myself wearing this one, even tongue in cheek, but a naughty debutante might feel differently. 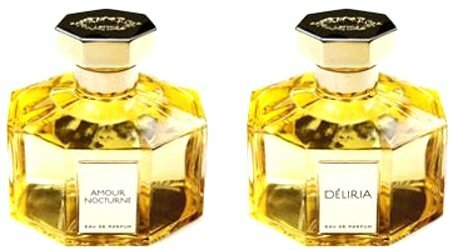 L’Artisan Parfumeur Explosion d’Emotions Amour Nocturne and Déliria Eaux de Parfum are $280 each for a 125 ml bottle. For information on where to buy them, see L’Artisan Parfumeur under Perfume Houses. 1. In other words, “seven-sided.” Yes, I had to look it up. I like the idea of “sophisticated pastries steeped in liqueur” but not sure I want to smell like that all day. Or pay that much to smell like that. I find it interesting gunpowder is a note in Amour Nocturne. Gunpowder makes me feel anxious and I cannot imagine it being in a perfume. I’m actually OK with a cooling pistol itself, I just can’t stand the lingering smell. However, this now makes me want to try this just to see how it blends in. I can’t honestly say that the gunpowder made a big impression on me either way, given all the pastry and cedar I smelled. The concept was interesting, though. A friend of mine tried these as well..from her descriptions, I am not rushing out to sample these. They really just don’t perk my interest..and the price, meh, really? The price really is up there! I was surprised. Sure, you get 25 ml more than the usual big bottle, but for twice the price? I don’t get the larger, more expensive bottles at all. Did their market research turn up an untapped demand from people who said what they really wanted was something huge and expensive? Or did they just cynically observe that it’s working for them so far to phase out the 50-ml bottles, so they might as well see if they can get people to pay more for an even larger bottle? These sound sort of interesting, and I liked the Skin on Skin sample I have, at first sniff (haven’t tested it systematically yet). The series might have worked for me in a coffret like the one that small bottles of Piment Brulant, Saffran Troublant and Poivre Piquant. I would have much preferred the coffret–or at least a 50 ml option. The same coffret you’re talking about is the one that got me hooked on Safran Troublant, and the amounts of the others I have are perfect. Amour Nocturne sounds quite interesting indeed! (Fragonard does an AMAZING Brioche Candle btw.) However though, the gun powder note listed, does it actually lend some metallic-y sense to the fragrance or smokiness or…? Deliria has a pronounced metallic note, but I really don’t get much of anything like that in Amour Nocturne. There’s an almost incense-y touch, but I’m pretty sure that it’s from the cedar. I liked Amour Nocturne well enough, and Deliria will have its fans, I’m sure, but they don’t come cheap, that’s for sure. I tried all three from this line and ended up only finding Amour Nocturne wearable. The gunpowder in this was smoky and nicely offset by the caramel sweetness. However, Deliria smelled like a combo of blood and cotton candy to me. I ultimately had to scrub it, though I wore it for at least an hour. I did obtain a small decant of Amour Nocturne though, and have enjoyed it. However, the price point on theses does seem out of line. Amour Nocturne was my favorite, too–although not enough to tempt me to buy it. I like how the cedar adds something unexpected to the pastry-like top, though. What a coincidence. I received an order from Twisted Lily today, and it includes samples of Amour Nocturne, Deliria, and Skin on Skin. They are those things that you peel off of the card. I will try them later, as I chose to try the vial of 1899 Hemingway first. I’m enjoying it so far — it’s a lot like Spicebomb with the tiniest hint of juniper. I need to try Egoiste the next time I am at Nordstrom. I’m curious about Hemingway, too. I’ll have to seek that one out. oh, it’s good, the Hemingway. I got a rather large juniper note on top but the cinnamon and vanilla. I love this scent on me, wouldn’t care for it on a man. It’s so much better than Spicebomb, imo. I would love a decant. Oh, creme brulee with plastic? That doesn’t sound very nice. I sampled these, and Amour Nocturne is my favorite of the three. It reminded me strongly of Bois Farine. I tried the two side by side, and Bois Farine is more original (cleaner composition, perhaps? not simply because it was the first!). But, I hate to say this, there is that persistent peanut (or something?) note in the dry down of Bois Farine that starts to annoy me after a while which does not appear in Amour Nocturne. I don’t plan to buy it (too expensive, the name is too dumb, and I don’t need more perfume), but I have to admit that I didn’t mind wearing it. I can definitely see the resemblance in how bready both fragrances are. I like Amour Nocturne, too, but as you say: those prices! so much perfume already! It’s hard to be tempted to buy it. Interesting reviews of scents I have tried to understand let alone like. I have found it hard to get past my initial impression of “how much??? for weird gourmand???”. And I can do gourmand – Anima Dulcis is on my to buy list. *sigh* I know. It’s great to be able to try them, even if I know I’d probably never buy them. call me cynical, but I think they saw people spending away on other perfumes and felt their price point was looking too cheap, so they decided to up the ante. It’s getting so everything is at least $100 more than about a year and a half ago. I know! Prices are exploding! At some point it has to backfire on them. It’s getting ridiculous.